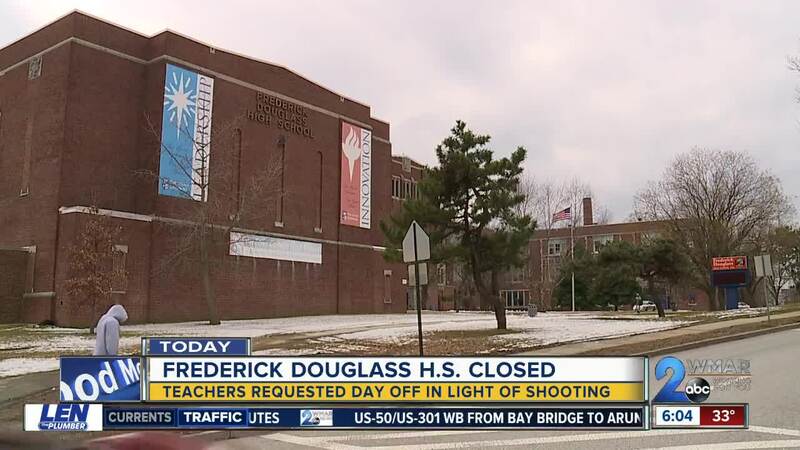 Baltimore City School officials have closed Frederick Douglass High School on Thursday following the recent shooting of a staffer at their school last week. BALTIMORE, Md. — Baltimore City School officials have closed Frederick Douglass High School on Thursday following the recent shooting of a staffer at their school last week. Frederick Douglass High School was closed on Monday and Tuesday to "allow time to plan counseling and support for students following Friday's shooting at the school". On Wednesday the school district announced a 2-hour delay, but school officials say staff members and students were not ready to go back. The high school was dismissed at 12:50 p.m. after starting school at 10 a.m. The school district says Thursday's closing will allow time to plan counseling and support for students. Staff members are still expected to report on the regular schedule for meetings and counseling will continue to be available. The closings and delays comes after a school staffer was shot by the 25-year-old brother of a student during school hours. Baltimore City School Police officers who were inside the building at the time of the shooting were able to arrest 25-year-old Neil Davis. Davis was charged with attempted first degree murder and firearms violations.